Dips, chutneys and raitas are my way to include more vegetables in every meal. These work like eatable smoothie for me and make my meals interesting to say the least. Life is so much more convenient when there are a few dips in the fridge. Lunch boxes can also be made convenient with some flavourful dips that keep well for a week or so in the fridge. Addition of yogurt or seeds and nuts adds nutritive value to roasted, sauteed or steamed vegetables to make a dip. Making a few dips in a single day may get a lot of work to do but if we plan well we can keep making 3-4 per week in large batches and refrigerate them all in glass jars. This makes it easy to have a few options available always to serve with vegetable sticks or steamed vegetables, to spread on breads and to serve with even paratha breakfasts to kids. For lunch boxes I feel a simpler meal becomes much more enjoyable when there are two different dips packed with it. My millet type breads are always made tastier with these dips. 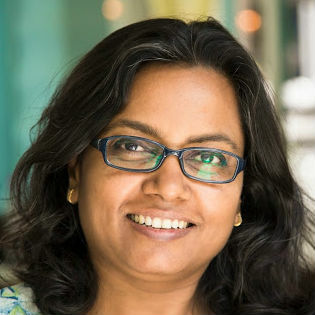 I rely on the raitas, chutneys and parval ka chokha or baingan ka bharta or baingan ka raita type mashed vegetables when there are no dips in the fridge. Especially in summers I sustain on watery vegetables and mashed vegetables that can be eaten at room temperature. My system just can't work unless I have loads of vegetables and bharta, chokha and raita becomes an everyday staple. Soups are for winters of course. Another broccoli dip with green garlic shoots and quark cheese is a winter favourite in my home, and an aubergine and nuts dip is made frequently in all seasons. I like hummus too but he vegetable based dips are more my type. Chickpea hummus, red kidney beans hummus and mung bean hummus can be great for lunch boxes too if you carry some steamed vegetables to have them with. 1. Beetroot Tzatziki with garlic.. I have adapted the classic Greek tzatziki into a potent garlicky dip that goes a long way in ensuring your meal is never boring. 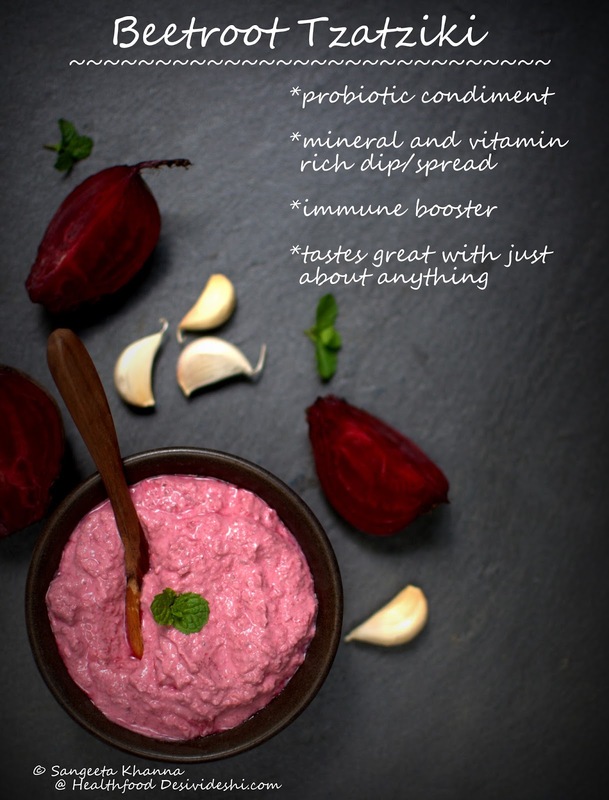 The colour and antioxidant boost comes form beetroots and garlic makes it irresistible. It will remind you of garlic thoum (or toum). Whisk everything together with salt to taste and some white pepper. Garnish with mint if you wish. 2. Baba ghanouj the roasted eggplant dip.. There is nothing special about baba ghanouj in fact. We always have some seeds, some yogurt at home and we always get the aubergines char grilled to make either a bharta or raita. In fact there is always some char grilled baingan in a glass container in my fridge. I love it so much I keep experimenting with it a lot. 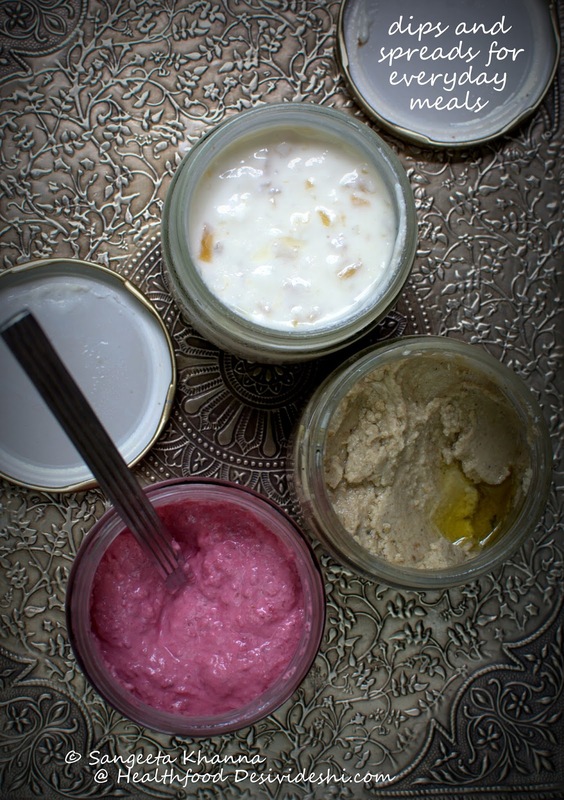 In this recipe I have used a little yogurt, and a mix of seeds to make this baba ghanouj, normally it is made using tahini (sesame paste) and no yogurt is added. Addition of yogurt makes the dip lat longer in the fridge and makes it probiotic in nature too. Char grill 2 large eggplants (aubergines or baingan), peel and reserve the flesh. Mix 2 tbsp each of sunflower seeds, sesame seeds and melon seeds along with salt, roasted cumin powder, 4 cloves of garlic and 1/4 cup thick yogurt and blend well in a mixie jar. 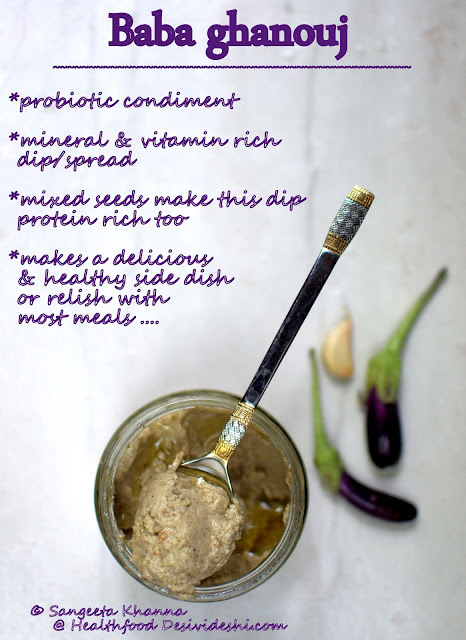 Add the roasted eggplant to the blender and blend once more to make a smooth dip. Add minced parsley or coriander greens if you wish. Fill in a glass jar and pour 2-3 tbsp extra virgin olive oil to make a top layer and refrigerate up to 2 weeks. I use red bell peppers occasionally but in smaller amounts in recipes, the reason is that the husband is intolerant to bell pepper smell. But I love them so I try and make recipes where the red bell pepper smell is subdued by something else. It is a practical way to make something suitable for both of us. This red bell pepper dip is 'supplemented' with loads of shallots, some garlic and some sun dried tomatoes. I say supplemented with shallots because shallots and onions both are so nutritive that their nutritional value is comparable to milk, and unlike milk the onions are loaded with Vit C too. So including onions and shallots is a great way to ensure efficient nutrition as I say. Recipe of the red bell pepper and shallots dip..
Chop one large bell pepper and about 15 shallots (or one large onion) roughly. Heat 1 tbsp mustard oil in a pan, tip in 8 peeled whole garlic pods, 3 whole bedgi red chillies (or add paprika later) and fry for a second. Add the chopped shallots and bell peppers, toss to let everything sear and caramelize. Add salt and mix. Remove from heat and add a handful of sun dried tomatoes, a handful of (about 2 tbsp) sun flower seeds and 2 tbsp vinegar. Transfer everything to a blender and make a coarse paste. Store in a glass container for up to 2 weeks. 4. Spicy Apricot chutney recipe .. I learnt this recipe from Lata Bharti, the owner and hostess at Raju Cottage at Goshaini (HP). She is a generous host and loves chatting up if you are not clicking her pictures. We share recipes, stories and talk about general life whenever I am visiting Raju's Cottage which has become a refuge for us. This apricot chutney we loved so much that Lata packed a jar for us. 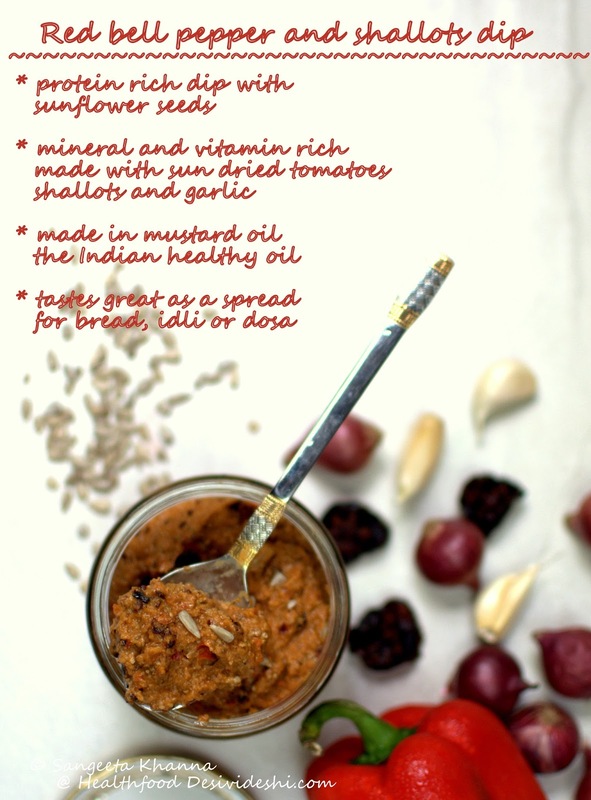 Then I made it at home and found it a very useful chutney just like our own tamatar ki mithi chutney, but with a little twist. 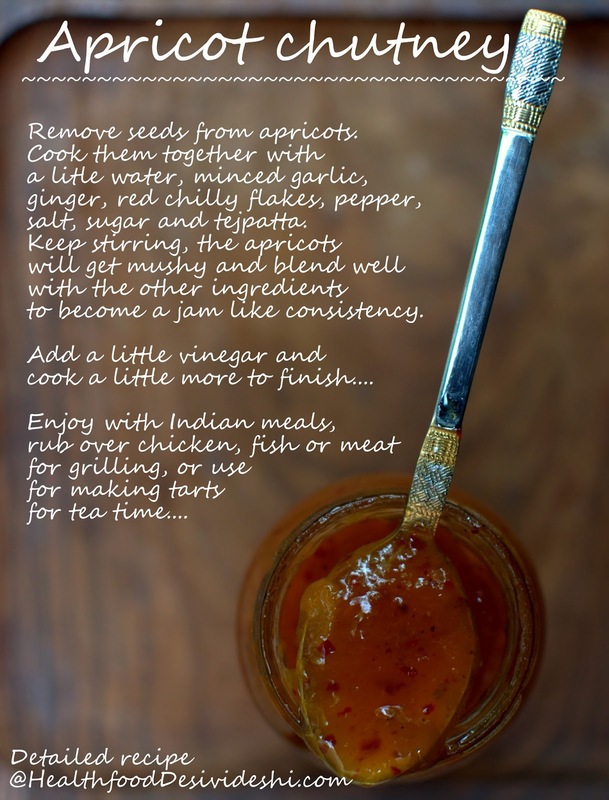 Recipe of spicy apricot chutney.. Remove sees from about 250 gm fresh apricots, mince 4 pods of garlic and 1 inch piece of ginger. Mix the above with 1/2 cup of water and 1 tsp, red chilli flakes, 1/4 tsp pepper powder, 2 tejpatta leaves, 1/2 tsp salt and 1/2 cup sugar. Cook the above mix till the apricots get amalgamated with the other ingredients and it smells nice and spicy. Stir and cook till it starts looking almost like a jam. Add 3 tbsp vinegar, stir to mix and fill in a sterilised glass jar. This chutney keeps well without refrigeration for long. This is one of those quick recipes that save you in difficult times. Just mix a few things in 2 minutes and a nice condiment is ready. This is actually a relish and can be blended to make a dip depending on what you want to serve with it. Chop a ripe mango roughly. Sweet and sour type of mango will be suited more but you can add a bit of lime juice if the mango is all sweet. Add a dash of balsamic vinegar, red chilly flakes and salt and your relish is ready. Mash it or blend it to make the way you like. 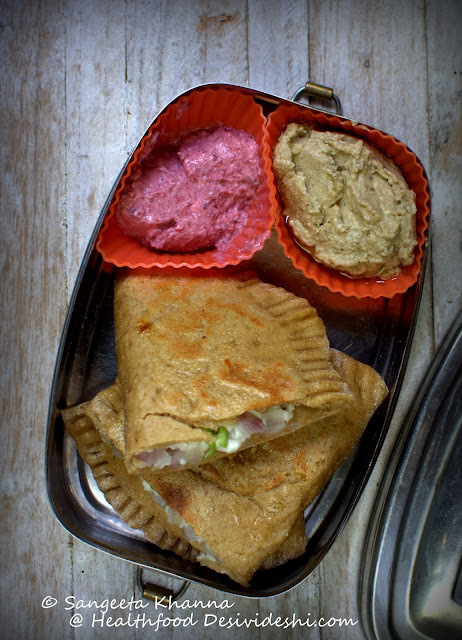 It tastes great with roti, paratha and sandwiched between bread slices. 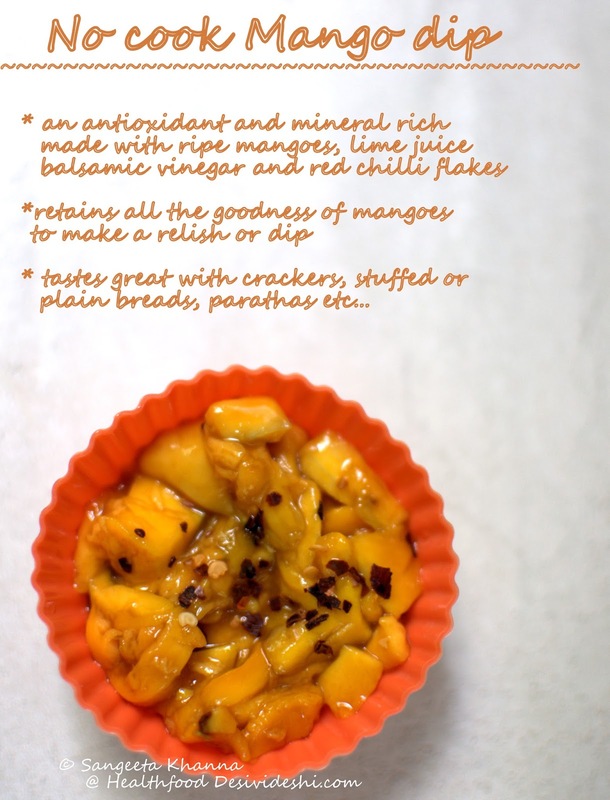 Or try it with poha and see how you like some nice mango poha. I am sure these dips will make your meals a bit more interesting, the lunch boxes a bit more colourful and flavourful, packed with nutrition nonetheless. Please let me know if you make these. The quick homemade tomato ketchup would also be helpful in ensuring you never eat those hideous sauces anymore. And please don't forget to comment on the ongoing lunch box series. there are a few giveaways you might like to win for yourself. Please read the series and give me your feedback. See you really soon with yet another lunch box post in a day or two. I am trying to keep my promise to announce the giveaways by the end of July.